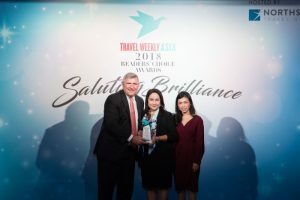 Singapore (Singapore) – October 17, 2018 (travelindex) – Best Western Hotels & Resorts has continued its winning streak at Travel Weekly Asia’s Reader’s Choice Awards, after it was named “Asia’s Best Midscale Hotel Chain” for a fantastic fourth consecutive year. The world-renowned hotel group received its latest honor at the 2018 Reader’s Choice Awards, which were voted for by the readers of Travel Weekly Asia – one of the region’s largest and most respected travel trade publications. The award was presented to Best Western at a glittering award ceremony in Singapore on Monday October 15, 2018. “It is a great honor to be named as Asia’s Best Midscale Hotel Chain’ once again. Best Western has developed multiple new brands in recent years, catering for exciting new market trends. These include Vīb®, our millennially-minded urban hotel concept, which we believe represents the future of midscale accommodation,” commented Olivier Berrivin, Best Western Hotels & Resorts’ Managing Director of International Operations – Asia. “We look forward to introducing guests to Asia’s first Vīb hotels later this year. I am confident that the region’s travel trade will love our innovative new midscale products as much as they love our classic midscale Best Western hotels. On behalf of everyone at Best Western, I would like to thank the esteemed readers of Travel Weekly Asia for voting for us once again,” Olivier added. This year, Travel Weekly Asia handed out a total of 56 Readers’ Choice Awards across 10 different categories. These awards were created to celebrate the hotel industry’s leading stars – brands that push the boundaries and raise the bar for hospitality in the region, earning the respect of customers and travel trade professionals alike. Best Western Hotels & Resorts has now held the title of “Asia’s Best Midscale Hotel Chain” every year since 2015.